Come enjoy a real beach experience in our vintage beach bungalow that's a stone's throw to the sand. Enjoy the beautiful weather and the amazing sunsets! The Central Coast is the closest place to paradise in California! 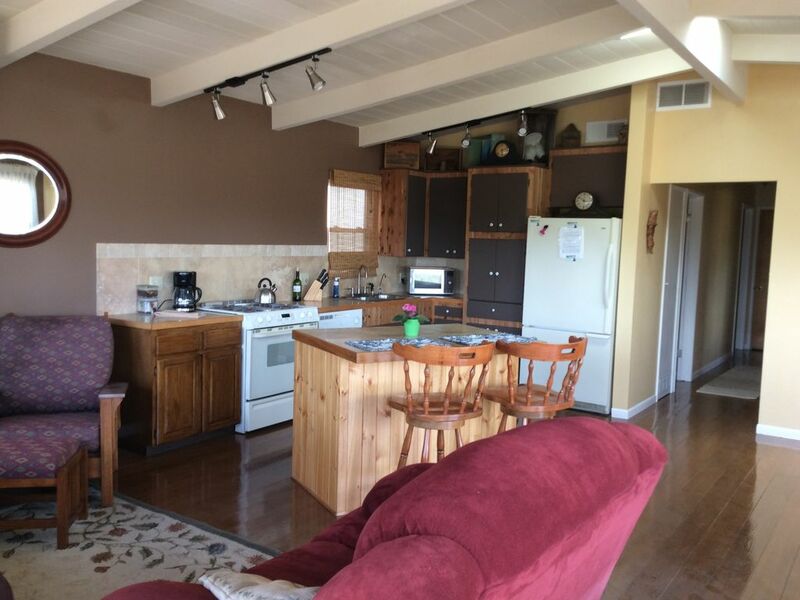 This 3 bedroom and 2 bath bungalow has everything one would need to be away from home. It sleeps eight people comfortably, 3 queen beds and a queen pillow top air mattress For extra sleeping. The kitchen is equipped with a microwave, coffee maker, waffle maker, toaster, pots and pans, and a dishwasher for your convenience. The livingroom has a 32'' flatscreen with a DVD/VHS player and a library of movies for all ages to choose from. The stereo system has am/fm, CD player for your listening enjoyment. The closet is filled with towels, linens, and extra blankets for your comfort. The backyard has a picnic table, gas grill, lounge chairs, and sand toys for the little ones. Here, the best time of year is all year! Kelly is quick to respond and the home had everything we needed. It is conveniently located being very close to the beach and the main street. Kelly was great, answered all our messages fast and answered all questions. The house was spacious and very clean. We had Thanksgiving dinner and the house was equipped with all the cookware and dishes we needed. There was no internet but that made it more fun, we placed board games and cards and actually talked! Great time for family!! Our friends and I met up at the house, neither of us had ever rented a vacation house. However, since they have two young girls, a house instead of a hotel was the way to go. Kelly made it very easy and understandable. She was very patient thru the process, as both my friend and I had to communicate long-distance to finalize details. The house was just as we hoped, and the beach was closer than we thought, a mere 20 second walk. It was a wonderful stay and we would go back there in a heartbeat, if we could! Kelly was great to deal with throughout this whole process - she was extremely accommodating with our schedule and really easy to work with. The house is so quaint and was immaculate when we arrived - it was perfect for the six of us who stayed there. The house is surrounded by much higher houses though, so you don't get much of a beach view - that being said, it takes a whole 3 minutes to walk out to the beautiful beaches of Oceano (where bonfires are allowed!). Rent here was relatively reasonable and I liked the fact that we weren't surrounded by the chaos at Pismo Pier (although it was a short enough drive for us to head over). Grocery stores (Vons) and coffee shops (Red Dirt Coffee is the best!) are easily accessible in Arroyo Grande, so we didn't have to waste time wandering around. As a bonus, Kelly left us fresh bagels and cream cheese upon our arrival - we devoured a few right when we arrived because we were so hungry...deeelish! I'm so happy we found this place - we will definitely be back soon. $300 per night/ $1800 a week We are pet friendly, however there is a $175 pet fee. Property owner has the right to refuse this option at any time. This is a perfect place for business travelers, travel nurses, and Diablo outage workers. $3600 monthly, plus $800 security deposit on the monthly rentals, plus $250 cleaning fee. Please call Kelly for availability.